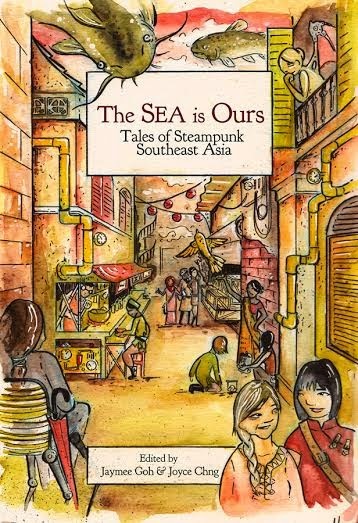 Remember how I told you about how my awesome friends Jaymee Goh and Joyce Chng were editing an anthology of Southeast Asian steampunk? Well, here’s the cover, in it’s full beauty. Gorgeous artwork! Stirs the imagination for what a steampunk, sci-fi story placed in an Asian setting might look like. I can’t exaggerate how desperately diverse voices are needed in our literature landscape. This book is not only an opportunity for readers to consume non-Eurocentric sci-fi stories; it is also an opportunity for Asian writers to produce, publish and circulate their stories the way they wish to tell it. This is a must on every SFF-geek’s wishlist! If you’d like to know a little bit more about the project, take a look at these series of tweets generated from the #SEAsteampunk chat held last week! There is also a table of contents up and running on Jaymee’s blog, to give you a better sense of the voices involved in the project! Check her site for updates on the project as it evolves! This entry was posted in Uncategorized and tagged #WeNeedDiverseBooks, cover, steampunk. Bookmark the permalink.